Cannon rushed twice for 16 yards and failed to catch his lone target in Sunday's 38-3 loss to the Patriots. He finishes his rookie season with 113 yards and a touchdown on 38 carries, plus another 144 yards on 17 carries. Analysis: The sixth-round selection will be fighting for a roster spot with the Jets next season, though he'll likely have the inside track on the No. 3 running back role. Cannon's greatest asset is his speed, which could turn him into a future threat in the return game as well. He struggled with ball security on special teams in the preseason, so he'd be wise to work on that weakness ahead of his second NFL campaign. Cannon rushed twice for four yards and caught one of two targets for five yards in Sunday's 44-38 overtime loss to the Packers. Analysis: Cannon didn't get much work in a change-of-pace role behind Elijah McGuire. The speedster out of Virginia St. will complete his rookie campaign against the Patriots in Week 17. Cannon (toe) carried the ball seven times for 13 yards and caught three of four targets for 24 yards in Saturday's 29-22 loss to Houston. Analysis: Cannon worked as a change-of-pace option behind Elijah McGuire, and that will be the case moving forward with Isaiah Crowell on injured reserve with a toe injury of his own. Neither Jets running back was able to get much going against the stout Houston front, but there should be more running room in Week 16 with the Packers coming to town. Cannon (toe) is active for Saturday's game against the Texans. Cannon (toe) is listed as questionable on the Jets' final Week 15 injury report. Analysis: Initially, it appeared as though Cannon would approach Saturday's contest against the Texans free of an injury designation, but a limited practice session Thursday has him listed as questionable. If Cannon is able to suit up this weekend, he'd be in line to work behind Elijah McGuire (ankle), with the Jets' top rusher Isaiah Crowell already ruled out. Cannon (toe) does not carry an injury designation for Saturday's game against the Texans after practicing fully Thursday, Andy Vasquez of The Bergen Record reports. Cannon (toe) returned to practice Wednesday as a limited participant, Darryl Slater of NJ.com reports. Analysis: With each of the Jets' three running backs bothered by an injury, Cannon could handle a significant role if he's able to suit up for Saturday's game against the Texans. Isaiah Crowell (foot) missed another practice Wednesday, while Elijah McGuire (ankle) joined Cannon as a limited participant. The Jets will release their final injury report Thursday. Cannon (toe) did not practice Tuesday, Darryl Slater of NJ.com reports. Analysis: Cannon appears to have sustained a toe injury during Sunday's 27-23 win over the Bills. The rookie sixth-round pick could be in line for a notable workload if he's able to get healthy in the near future, with Isaiah Crowell (toe) nursing what appears to be a significant injury. However, Saturday's approaching matchup against the Texans' stout defensive line does not inspire much confidence in Cannon even if he were to serve as the Jets' top running back. Cannon rushed five times for three yards and a touchdown while catching his lone target for four yards in Sunday's 27-23 win over the Bills. Analysis: Cannon was mostly quiet even though fellow running back Isaiah Crowell was forced to exit due to a foot injury. The rookie running back did manage to find paydirt on a 4-yard carry in the second quarter, but Cannon's lack of usage relative to Elijah McGuire following Crowell's injury doesn't inspire much confidence ahead of New York's Week 15 meeting with the Texans, regardless of Crowell's health. Cannon rushed four times for 18 yards and added a seven-yard reception on his lone target in Sunday's 26-22 loss to Tennessee. Analysis: Cannon outplayed Elijah McGuire, who gained only 15 scrimmage yards on seven touches. Both guys were little more than change-of-pace options behind Isiaiah Crowell, and that should be the case once again in Week 14 against Buffalo. Cannon (hamstring) won't carry an injury designation into Sunday's game against the Titans, Turron Davenport of ESPN.com reports. Analysis: Cannon began the week sitting out practice but was able to progress to full participation Friday to avoid an injury tag. The 24-year-old should serve his usual role as a depth running back for the Jets. Cannon (hamstring) practiced on a limited basis Thursday, Andy Vasquez of The Bergen Record reports. Analysis: Cannon suffered the hamstring injury in Sunday's loss to the Patriots and only logged nine offensive snaps. The fact that the Virginia State product was able to log limited practice time is a positive sign for his Week 13 availability. Even if he does play, Cannon still stands third on the depth chart behind Isaiah Crowell and Elijah McGuire. Cannon didn't practice Wednesday due to a hamstring issue, Rich Cimini of ESPN.com reports. Analysis: Cannon likely picked up in the injury in Sunday's loss to the Patriots, during which he played nine offensive snaps and nabbed one reception for minus-3 yards. The sixth-round rookie's status is uncertain heading into the Week 13 matchup with the Titans, but he looks to be no better than third in the pecking order at running back anyway with Elijah McGuire and Isaiah Crowell splitting most of the work. Cannon caught one pass for minus-3 yards in Sunday's 27-13 loss to the Patriots. He didn't record a rushing attempt. Analysis: Elijah McGuire has scooped up the touches that were going to Bilal Powell before Powell's neck injury, relegating Cannon to a minuscule role behind McGuire and Isaiah Crowell. The rookie speedster has some dynasty format value, but he's bordering on useless in redraft leagues. Cannon rushed four times for 30 yards and added a five-yard catch on four targets in Sunday's 41-10 loss to the Bills. Analysis: Cannon got fewer touches than both Elijah McGuire and Isaiah Crowell, who finished with nine apiece. If both of those guys can stay healthy after New York's Week 11 bye, Cannon will have a hard time carving out a large enough role to attract attention outside the deepest leagues. Cannon caught his lone target for 15 yards and didn't get a single carry in Sunday's 13-6 loss to the Dolphins. Analysis: Cannon's role shrank dramatically with Elijah McGuire (foot) back from injured reserve to split carries with Isaiah Crowell. The speedy rookie will be tough to depend upon in fantasy as long as the Jets have two healthy running backs ahead of him. Cannon's touches will likely be limited again in Week 10 against the Bills. Cannon rushed six times for 10 yards and caught three of four targets for 12 yards in Sunday's 24-10 loss to Chicago. 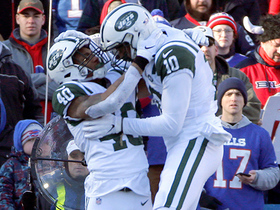 Analysis: Cannon got the passing-down work with Bilal Powell (neck) on injured reserve. New York's running back situation could get more muddled against the Dolphins in Week 9, with Elijah McGuire (foot) eligible to come off injured reserve to join Cannon and Isaiah Crowell in the backfield. Cannon is expected to act as the primary backup to Isaiah Crowell during Sunday's game in Chicago following Bilal Powell's (neck) placement on injured reserve, ESPN.com reports. Cannon rushed twice for four yards and caught four of five targets for 69 yards in Sunday's 37-17 loss to the Vikings. Analysis: Cannon took over on passing downs after Bilal Powell exited due to a neck injury, and the shifty rookie actually ended up leading the team in receiving yards thanks primarily to a 35-yard catch. He had some problems holding onto the ball in preseason, but Cannon's excellent speed could make him worth a deep-league dart against the Bears in Week 8 if Powell's injury keeps him out. Isaiah Crowell should remain the primary option on early downs. Cannon rushed six times for 15 yards and caught his only target for six more in Monday's 48-17, Week 1 win over Detroit. Analysis: The game's lopsided nature allowed New York to work Cannon into the mix, but Isaiah Crowell and Bilal Powell dominated touches out of the backfield while the result was still hanging in the balance. Cannon showed no signs of the ball-security issues that bothered him in the preseason, which bodes well for the speedster's chances of expanding his change-of-pace role as the season unfolds. Cannon survived Saturday's round of cuts, and will open the season on the Jets' 53-man roster. Cannon rushed 11 times for 29 yards and failed to haul in either of his two targets in Thursday's preseason finale against the Eagles. He also racked up 25 yards on one kick return and 31 yards on his lone punt return in the 10-9 loss. Analysis: Cannon failed to get much going on the offensive end, but he showcased his explosiveness in the return game. The rookie also didn't put the ball on the ground, which is notable given his ball security problems throughout the preseason. Elijah McGuire's foot injury could allow Cannon to sneak onto New York's roster as the third-string running back, but he's more likely to end up on the practice squad given how raw he looks at the moment. 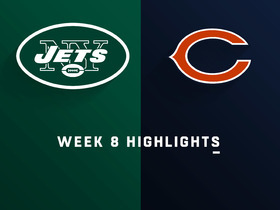 Cannon rushed five times for 23 yards, secured all four of his targets for 30 yards and returned three kickoffs for 71 yards in the Jets' 22-16 preseason loss to the Giants on Friday. He also lost a fumble. Cannon (ankle) has retaken the field for practice, Manish Mehta of the New York Daily News reports. Analysis: Cannon has been sidelined of late by an ankle issue, but that now appears to be behind him. The sixth-round rookie back was considered the favorite for third-string duties early in camp, though the injury may have changed those plans slightly. Even if he doesn't see the field consistently on offense this season, he could be a contributor on special teams. Cannon (ankle) worked into Saturday's no-pad practice but sat out Sunday, Matt Stypulkoski of NJ.com reports. Analysis: Cannon is eyeing the No. 3 RB spot since Elijah McGuire (foot) has a good chance of landing on the PUP list and missing the first six weeks. The rookie sixth-round pick rushed 212 times for 1,638 yards and 17 touchdowns during his final season at Virginia State, but his touches will be limited in 2018 behind Isaiah Crowell (concussion) and Bilal Powell. 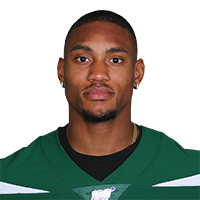 Cannon (leg) did not play Thursday but is expected back for the Jets' next preseason game against the Giants,Ralph Vacchiano of SportsNet New York reports. 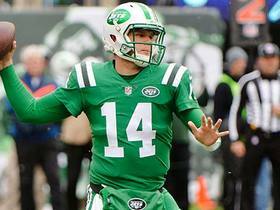 Analysis: The rookie out of Virginia State was a game-time decision coming into Thursday's game and the Jets' coaching staff opted to keep him on the sideline rather than force the issue. Coach Todd Bowles sounded confident that Cannon will be ready for the team's third preseason game. Cannon is jockeying for position on the Jets' running back depth chart along with Thomas Rawls and George Atkinson. Cannon is dealing with an ankle injury and is questionable for Thursday's game against the Redskins, Eric Allen of the Jets' official site reports. Analysis: Cannon's exact injury isn't clear, though he's been seen icing his ankle at practice the past couple of days. The team hasn't ruled on his status for Thursday's game, but he may be limited or held out entirely. His absence would open up reps for Thomas Rawls and George Atkinson. Cannon rushed 11 times for 40 yards and caught three of four targets for five yards in Friday's 17-0 win over the Falcons to open the preseason. Cannon (foot/ankle) is practicing Tuesday, Manish Mehta of the New York Daily News reports. Analysis: The sixth-round rookie was removed from Monday's practice but won't miss any more time. With Elijah McGuire (foot) unlikely to be ready for the start of the regular season, Cannon is the new favorite to enter Week 1 as the Jets' No. 3 running back. It helps that Thomas Rawls (undisclosed) is having trouble staying healthy. Cannon left Monday's practice early due to a foot/ankle injury, Ralph Vacchiano of SportsNet New York reports. Analysis: Cannon had an impressive day at camp prior to the injury, making noise as the clear favorite for the No. 3 RB role in the wake of Elijah McGuire's foot injury. The severity of the sixth-round rookie out of Virginia State's injury is not yet known, but trainers were examining his left foot and ankle. Cannon has established himself as the favorite for New York's No. 3 running back role in the wake of Elijah McGuire's foot injury, Matt Stypulkoski of NJ.com reports. New York Jets running back Trenton Cannon rushes for a 4-yard touchdown. 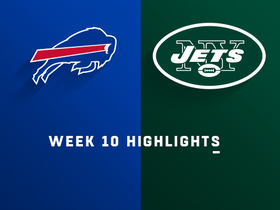 Watch complete highlights from the Week 10 matchup between the Buffalo Bills and the New York Jets. 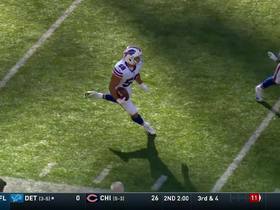 Buffalo Bills linebacker Matt Milano intercepts Jets quarterback Josh McCown and returns if for a 29-yard gain. 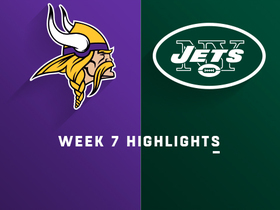 Check out the highlights from the Minnesota Vikings matchup against the New York Jets in Week 7. New York Jets quarterback Sam Darnold completes a deep pass to running back Trenton Cannon for a 35-yard gain.